The thickness of the toppings ranges from 0.5mm to 12mm . The thicker the topping the greater the area which load can be dispersed .since it is jouint less, there will be no accumulation of bacteria.it is recomended for pharma & food Industry .Reduces wear & tear of the concrete asthetically unmatched to other systems . The flooring is the most abusive part of any Industrial, commercial or Institutional buildings exposing to both physical and chemical abuses like the presence of dust, continuous equipment traffic, oil and chemical spillages from occasional to continuous immersion leading to degradation of floor surfaces. Application/Usage: Industrial and commercial areas,chemical or pharmaceutical manufacturing company,food industries,malls,schools etc. Its outward appearance is as clean as a mirror, is clean and anti-dust. Hence preferred to use in places where high level of safety and hygiene are required. Reckoned amid one of the credible market names, we are willingly betrothed in offering to our patrons Industrial Epoxy Polyurethane Flooring. 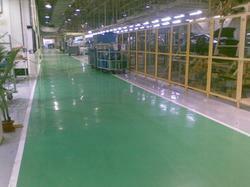 Usage/Application: all industrial area subjected to heaviest traffic, shops floors, heavy engineering industries, etc..
Our offered Florquartz SL Epoxy Floor Topping is one of our most reliable and durable multi-colour epoxy floors available in varied shades that enhances the look and make the floor highly attractive. Furthermore, these are tough thus withstands foot and light vehicular traffic with excellent chemical resistance to most chemicals. 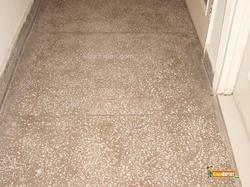 - It is a high strength, self- leveling cement based underlayment for interior concrete and engineer approved floors.